A variety of accommodation is available in Belo Horizonte, ranging from luxurious 5-star to more budget-friendly 2-star hotels and guest houses. 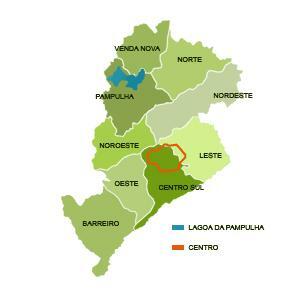 We are recommending two special regions for accommodation: Pampulha and City Center (see map on the side). Pampulha is the area where the university is located in, and in which is placed the patrimony built by the most famous Brazilian architect Oscar Niemayer who planned Brasilia. The hotels in this region are located around 5-10 minutes from the conference venue by car or bus. Although these hotels are very near to the conference venue, there are not many places for food and shopping around them. If participants want to stay in Pampulha they should take a taxi to reach the good restaurants and shops of the area. The other hotels are in the City Center and located into two very close areas: Lourdes and Savassi. Lourdes is an elegant and quiet area served by very good restaurants, sophisticated shops and a shopping center with very easy access to banks. The other area Savassi, aside Lourdes, is a very traditional bohème area served with several restaurants, bars, coffees shops, shopping centers, banks and nightlife. Both Lourdes and Savassi are about 20 minutes from the conference venue by car or bus. We will provide special buses to pass in the main hotels to take-bring the participants to-from the conference venue. Besides, all hotels recommended have easy access to public transportation.